Objective: The purpose of this article is to analyze the effects of different shaped Agnanoparticles on peristaltic flow through curved tube with permeable walls. Method: In the considered endoscope the inner tube is rigid while outer tube experience a sinusoidal wave and both tubes make an annulus. Bricks, cylinders and platelets are different shaped Agnanoparticles. Toroidal coordinate system is used to examine the nature of Ag-nanoparticles mathematically in the curved tube with viscous fluid. Analysis is performed with the consideration of low Reynolds number and long wavelength approximation. 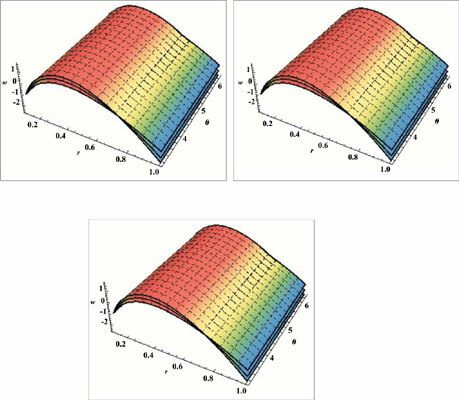 Perturbation approximation is used to solve the problem and achieve results for pressure gradient, pressure rise, axial velocity and stream functions. Results: The effects of various parameters such as Grashoff's number, Darcy's number, radius of the endoscope and amplitude ratio on flow variables have been discussed graphically. The contemporary investigation has revealed that the temperature profile shows a decrease for larger shape factor of Ag-nanoparticles. Pressure gradient exhibits higher results with larger Darcy's number. Also trapped bolus tend to have bigger size for greater shape factor. Conclusion: Temperature profile for the nanofluid decreases with the increase in shape factor m of nanoparticles. The trapping phenomena reveal that the size of inner bolus appears larger for platelet nanoparticles as compared to brick and cylinder nanoparticles. Keywords: Curved annulus, Ag-nanoparticles, peristaltic pumping, porous boundary, perturbation solution, permeable wall. Keywords:Curved annulus, Ag-nanoparticles, peristaltic pumping, porous boundary, perturbation solution, permeable wall. Abstract:Objective: The purpose of this article is to analyze the effects of different shaped Agnanoparticles on peristaltic flow through curved tube with permeable walls.